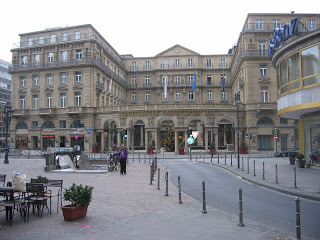 That little figure in the purple fleece is me standing in front of our hotel in Franfurt, which was not intended to be a stop on our way. This was not the easy part of the trip to Croatia. This was the smelly, expensive part. In fact, Michael wanted to burn that fleece. This was the part where our flight misconnected in Newark and we were re-routed through Paris on Air France (which I later heard has the nickname Air Chance) and they lost our bags for 4 days. We had a nice night in Frankfurt compliments of the airline and meandered along an outdoor Christmas market eating schnitzel and cocoa. Turned out this would not be the only outdoor Christmas market, we encountered one in Zagreb, Croatia and Trieste, Italy among other charming towns. Sometimes tragdies aren’t as tragic as they seem at the time. Except for the part about how we had to buy new connecting tickets to Croatia which put a little dent in the credit card. Unfortunately, she was so right. Well, not never. But 4 days is a long time to wait for your clothes while wearing the same purple fleece.